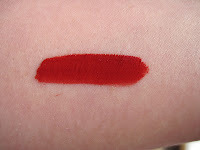 The Gilded Slipper: A True Red Lip Rouge! I finally succeeded at making a true red lip rouge! This one is called 'Ava' and the secret ingredient is carmine. beautiful, I would love to wear this. OMG!! That's a gorgeous red!! Would love to get my hands on it. Truly beautiful. Great work!